Previously blacked-out portions of the Maher Arar report state that Canadian security officials believed the United States might send the Syrian-born Canadian to a foreign country to be questioned under torture. The blacked-out portions of the Arar inquiry's report were released on the July order of a Federal Court judge. 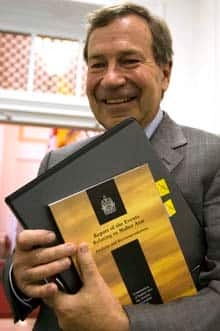 In his report, dated Sept. 18, 2006, on Canada's involvement in the extraordinary rendition and torture in a Syrian jail of Canadian engineer Maher Arar, Judge Dennis O'Connor makes 23 recommendations, grouped into eight broad categories. The RCMP should ensure it stays within its mandate as a police force to prevent and prosecute crime. Above all, it should ensure that it respects the distinct role of CSIS, the Canadian Security Intelligence Service, in collecting and analyzing information and intelligence relating to threats to Canadian security. This recommendation is aimed at reinforcing the division of functions between gathering security information and policing, as was outlined more than 20 years ago in the McDonald Commission report into the RCMP, O'Conner said. "I am convinced that Canadians will be best served if the RCMP and CSIS both operate within their distinct mandates and expertise, while sharing information when appropriate and working together in a co-operative and integrated manner." This does not mean that the RCMP should wait until an act of terrorism has occurred before taking action. The RCMPï¿½s mandate includes preventing crime, not just investigating after the fact. The Anti-terrorism Act has expanded both offences and the powers available to the RCMP. But it also imposes a variety of special safeguards, such as prior approvals by attorneys general and the courts. And the fact remains that, as has long been the tradition, police in a democracy should be concerned primarily with law enforcement, even in the national security context. The RCMP should continue to engage in integrated and co-operative operations in national security investigations, but agreements or arrangements in this respect should be set out in writing. Submissions to the inquiry stressed the dangers of police getting caught up in "investigative silos." Both Justice Fred Kaufmanï¿½s report on the Guy Paul Morin case and Justice Archie Campbellï¿½s review of the Bernardo investigations revealed the dangers inherent in police forces not working together or sharing information. O'Connor noted that the Canadian Security Intelligence Service Act (CSIS Act) does not contemplate a wall or watertight compartments to separate CSIS and the RCMP. CSIS may disclose to the RCMP and other police forces information that ï¿½may be used in the investigation or prosecution of an alleged contravention of any law of Canada or a province.ï¿½ What's more, he says, the expansion of criminal law in relation to terrorism, combined with the urgency of the policeï¿½s preventive mandate with respect to terrorism, may actually require CSIS to provide more information to the RCMP than was the case in the past. However, it is imperative that a special effort be made by all personnel in each institution to develop a better understanding and appreciation of the mandate and role of the other. The RCMP should ensure that those involved in national security investigations are properly trained in the particular features of such investigations. National security investigations involve subject matter not within the expertise or experience of normal criminal investigators. National security investigators must also understand the subject matter of global terrorism, the nature of and distinctions between tactical and strategic intelligence, the processes for information sharing and the need to be alert to human rights concerns when dealing with governments with questionable human rights records. The fact that an investigation is guided by strategic intelligence about al-Qaeda or another threat to national security does not necessarily mean that every person of interest to that investigation must be associated with al-Qaeda or terrorism. The RCMP should maintain its current approach to centralized oversight of national security investigations. O'Connor noted that he uses the term oversight here deliberately because it denotes involvement in investigations as they are being conducted, as opposed to the independent review that is the subject of his earlier Policy Review report. Oversight implies being informed and having powers of co-ordination and, where appropriate, control and direction that a review body will not have. Those with the power of oversight also become accountable for the decisions made by the people they oversee. Indeed, centralized oversight of national security investigations is designed in large part to heighten the responsibility and accountability of the commissioner of the RCMP as well as the minister for national security. The minister responsible for the RCMP should continue to issue ministerial directives to provide policy guidance to the RCMP in national security investigations, given the potential implications of such investigations. National security investigations have several features that make them different from other criminal investigations. There is a greater need for integration with other agencies, both domestic and foreign; there is more information sharing, often involving sensitive material; there is a greater need for centralized oversight with the RCMP and there are increased concerns about individual liberties. Ministerial directives are a useful tool in ensuring that the way the RCMP manages its national security investigations is consistent with ministerial accountability. O'Connor also urged that ministerial directives be readily accessible to the public, subject to valid national security confidentiality concerns. For example, he said, the November 2003 ministerial direction concerning the need for care and prior high-level approval before investigations may be conducted in regard to sensitive sectors such as academia, religion, politics or trade unions is a matter of public interest. In fact, public awareness about this ministerial direction could inspire greater public confidence in RCMP investigations potentially involving these sensitive areas. The RCMP should maintain its policy of sharing information obtained in the course of national security investigations with other agencies and police departments, both domestic and foreign, in accordance with the principles discussed in these recommendations. Two recent reports have stressed the importance of information sharing. Bob Raeï¿½s report on the terrorist bombing of Air India Flight 182 and the U.S. 9/11 Commissionï¿½s report both speak of the need for all agencies involved in national security investigations to co-operate and share information with one another. Information sharing is vital, but it must take place in a reliable and responsible fashion. The need for information sharing does not mean that information should be shared without controls. Nor does it mean exchanging information without regard to its relevance, reliability or accuracy or without regard to laws protecting personal information or human rights. The RCMPï¿½s Criminal Intelligence Directorate (CID) or another centralized unit with expertise in national security investigations should have responsibility for oversight of information sharing related to national security with other domestic and foreign departments and agencies. An important part of centralized oversight of RCMP national security investigations will be oversight of practices pertaining to information sharing, including both the provision and receipt of information. In the Arar case, the RCMP shared information with American agencies without adequate oversight or control by headquarters, the inquiry found. Centralization of information-sharing decisions should assist in addressing subsequent requests from recipients of information for amendments to caveats. Centralizing this function within CID can also serve as a useful management tool, allowing for co-ordination of investigations and ensuring consistency in the information to be shared. The RCMP should ensure that, whenever it provides information to other departments and agencies, whether foreign and domestic, it does so in accordance with clearly established policies respecting screening for relevance, reliability and accuracy and with relevant laws respecting personal information and human rights. The 9/11 Commission in the United States concluded that, after 9/11, the largest impediment to ï¿½a greater likelihood of connecting the dots is the human or systemic resistance to sharing informationï¿½ and criticized the ï¿½need-to-knowï¿½ principle on the basis that it assumes it is possible to know, in advance, who will need to use the information. Such a system implicitly assumes that the risk of inadvertent disclosure outweighs the benefits of wider sharing. Those Cold War assumptions are no longer appropriate. The RCMP should never share information in a national security investigation without attaching written caveats in accordance with existing policy. One of the significant flaws in the Arar investigation was the failure to place caveats on information that the RCMP shared with American agencies. Failure to attach caveats is unacceptable because it increases the risk that information will be distributed by the recipient to unanticipated institutions and that it will be used for unintended and possibly unacceptable purposes. The RCMPï¿½s information-sharing practices and arrangements should be subject to review by an independent, arms-length review body. Canadian agencies other than the RCMP that share information relating to national security should review these recommendations to ensure their information-sharing policies conform, to the appropriate extent, with the approaches being recommended for the RCMP. Where Canadian agencies become aware that foreign agencies have made improper use of information provided by a Canadian agency, a formal objection should be made to the foreign agency and the foreign minister of the recipient country. Where appropriate, objections should be sent not only to the foreign agency, but to the foreign minister responsible for that agency. Such objections are necessary to prevail upon foreign agencies to comply with caveats. The Department of Foreign Affairs and International Trade (DFAIT) should provide its annual reports assessing the human rights records of various countries to the RCMP, CSIS and other Canadian government departments or agencies that may interact with such countries in connection with investigations. Each year, DFAIT prepares an assessment of the human rights records of countries with which the RCMP, CSIS and possibly other investigative agencies of the Canadian government may interact. Some of those countries may have poor or questionable human rights records. Unlike the U.S. State Department, DFAIT treats its reports as confidential and, in the past, has not even made them available to other agencies of the Canadian government. Leaving aside the issue of whether the reports should be made public, it is important, as a minimum, that DFAIT provide Canadian investigative agencies with the reports in order to establish a common and hopefully accurate basis upon which those agencies may make decisions. The RCMP and CSIS should review their policies governing the circumstances in which they supply information to foreign governments with questionable human rights records. Information should never be provided to a foreign country where there is a credible risk that it will cause or contribute to the use of torture. Policies should include specific directions aimed at eliminating any possible Canadian complicity in torture, avoiding the risk of other human rights abuses and ensuring accountability. The disclosure of information to an agency of a foreign government that does not share Canadaï¿½s respect for democratic or human rights may be considered if it is justified because of Canadian security or law-enforcement interests; can be controlled by specific terms and conditions and does not have a negative human rights connotation. Canadian agencies should accept information from countries with questionable human rights records only after proper consideration of human rights implications. Information received from countries with questionable human rights records should be identified as such and proper steps should be taken to assess its reliability. Decisions to receive information from countries with questionable human rights records should be reviewed by the appropriate review body such as SIRC for CSIS and the review agency O'Connor is proposing for the RCMP. The Government of Canada should develop a protocol to provide for co-ordination and coherence across government in addressing issues that arise when a Canadian is detained in another country in connection with terrorism-related activity. Essential features of this protocol should include consultation among relevant Canadian agencies, a coherent and unified approach in addressing the issues and political accountability for the course of action adopted. Canadian consular officials posted to countries that have a reputation for abusing human rights should receive training on conducting interviews in prison settings to be able to make the best possible determination of whether torture or harsh treatment has occurred. In some countries, consular officials are not permitted private visits with Canadian detainees. Because the detainee may not be able to speak freely, it is important that consular officials responsible for managing a detaineeï¿½s case know how to detect signs of abuse or torture, to the extent possible. Consular officials should clearly advise detainees in foreign countries of the circumstances under which information obtained from the detainees may be shared with others outside the Consular Affairs Bureau before any such information is obtained. In Ararï¿½s case, consular officials disclosed information obtained from Arar to the RCMP and CSIS based in part on perceived consent and in part on one of the exceptions to the prohibition against disclosure in the Privacy Act. Canadian agencies conducting national security investigations, including CSIS, the RCMP and the CBSA, should have clear written policies stating that such investigations must not be based on racial, religious or ethnic profiling. Although the RCMP has a policy of bias-free policing, concerns about racial profiling were raised by many of the interveners in the inquiry. Several senior officers of the RCMP who testified at the inquiry made it clear that racial, ethnic or religious profiling is not permitted. This recommendation adopts that approach. Canadian agencies involved in anti-terrorism investigations, particularly the RCMP, CSIS and the CBSA, should continue and expand on the training given to members and staff on issues of racial, religious and ethnic profiling and on interaction with Canadaï¿½s Muslim and Arab communities. There is a wide scope for involving members of Canadaï¿½s Arab and Muslim communities in training programs aimed at informing investigators of their culture, values and history. Some interveners in the inquiry suggested that a coherent training program could be developed in partnership with Canadian Muslim and Arab communities. The RCMP and CSIS should develop guidelines governing the circumstances in which "border lookouts," alerts to customs and immigration officers at ports of entry, may be requested both in Canada and in other countries. Border lookouts can be a useful investigative tool and may be very helpful in national security investigations. They are not the most intrusive type of investigative technique; however, since they do involve some invasion of an individualï¿½s privacy, they should only be requested when there is some basis for believing that information that may be obtained will advance an investigation. "Arar was properly a person of interest in the relevant RCMP investigation, as he was associated with suspects who were being investigated," O'Connor said. "Although the RCMP did not consider Arar a suspect, they had a legitimate interest in knowing more about him because of those associations. However, there was no information linking Ararï¿½s wife, Monia Mazigh, to any suspect or activities being investigated. Thus, there was no basis to request a lookout for her." In addition, when a border lookout is requested in another country, it is important to consider the implications of such a request for the liberty and rights of the individual targeted. It should not be assumed, the inquiry found, that all other countries will treat a lookout request as merely an information-gathering exercise. In the post-9/11 environment, with the increased concern about threats of terrorism, some other countries may react to information connected with terrorist investigations in a far more aggressive manner than Canadian authorities might intend. The Government of Canada should register a formal objection with the governments of the United States and Syria concerning their treatment of Maher Arar and Canadian officials involved with his case. The American authorities who handled Ararï¿½s case treated him in a most regrettable fashion, O'Connor wrote. They removed him to Syria against his wishes and in the face of his statements that he would be tortured if sent there. Moreover, they dealt with Canadian officials involved with Ararï¿½s case in a less than forthcoming manner. The inquiry concluded American officials were not candid, either with the RCMP officers with whom they had been working jointly on the investigation that involved Arar, or with Canadian consular officials seeking to assist Arar, about their intentions or about the process that led to his removal. The act of objecting will be more symbolic than anything else, O'Connor concedes. Unquestionably, he says, Canada should continue to co-operate fully with American authorities in the global fight against terror. The Government of Canada should assess Ararï¿½s claim for compensation in the light of the findings in this report and respond accordingly. "I have been asked to recommend that the Government of Canada compensate Arar for damages for his ordeal," O'Connor said. However, he noted, he is specifically precluded from making any findings or even assessments as to whether the Government of Canada would be civilly liable to Arar. "I wish to make two comments about Ararï¿½s claim for compensation," O'Connor wrote. "First, in addressing the issue of compensation, the Government of Canada should avoid applying a strictly legal assessment to its potential liability. It should recognize the suffering that Arar has experienced, even since his return to Canada. "Among other things, after his return, he was subjected to several very improper and unfair leaks of information that damaged his reputation, caused him enormous personal suffering and may have contributed to the difficulties this well-educated Canadian man has experienced in finding employment in his chosen field of computer engineering. "Ararï¿½s inability to obtain employment has had a devastating economic and psychological impact on both him and his family. In addition, as the inquiry has proceeded, some of the mental suffering that Arar experienced in Syria has re-surfaced. Based on the assumption that holding a public inquiry has served the public interest, Ararï¿½s role in it and the additional suffering he has experienced because of it should be recognized as a relevant factor in deciding whether compensation is warranted. "Finally, I have been asked to recommend that appropriate disciplinary proceedings be instituted with respect to Canadian officials involved in the Arar case. However, I have not assessed the evidence with that in mind. Those responsible for discipline will have my report. They can take my findings and decide what steps, if any, need to be taken."